I really wanted to like Something Happened in Our Town: A Child’s Story about Racial Injustice. I really wanted to, but I didn’t. Several psychologists with a history of working together in Atlanta, Georgia (Marianne Celano, Marietta Collins, and Ann Hazzard) collaborated to write the book, which is nicely illustrated by Jennifer Zivoin. The synopsis, printed on the back of the book, states: “Something Happened in our Town follows two families – one White, one Black – as they discuss a police shooting of a Black man in their community. 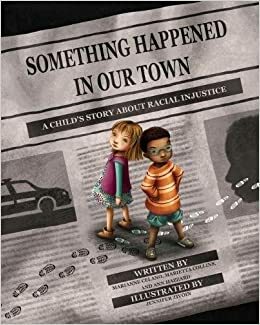 The story aims to answer children’s questions about such traumatic events, and to help children identify and counter racial injustice in their own lives.” I’m still waiting to read that book. Far from helping children grapple with racial injustice, the text reduces racism to personal bias, which can be overcome by acts of kindness. Even more, police shootings of unarmed Black Americans are only mentioned in passing, before moving on to less traumatic, hypothetical, instances of racism. It begins well enough. Adults think they can protect children from the news that a White police officer has shot and killed an unarmed Black man. They are wrong. A young freckle-faced white-skinned girl asks her parents why the police shot a man. Her mother evades the question, instead sharing that she feels bad for him and his family. Her father adds that the police made a mistake. Her older sister, Liz, corrects him, stating that it wasn’t a mistake, the man was shot because he was Black. Emily is confused because the man’s skin was brown not black, so her father explains race in the US. My main issue with the text is that systemic racism is collapsed into and, I would suggest, subsumed under language of personal bias. It is described as a pattern of “being nice to White people and mean to Black people.” Shooting and killing a Black man should not be described as “meanness” to make the concept more palatable to a young audience. A conversation about racism should not be pleasant. If it is, you are doing it wrong. The White family is all about overcoming racism, coded here as meanness, by treating people fairly, which I suppose is code for not shooting them? In an extension of the White family’s awkward “don’t be racist/mean” conversation, Emily’s mother asks her to imagine how Black children would feel if she had a birthday party “and invited everyone in [her] class except the Black kids?” Emily recognizes they would likely be sad or mad. As a result of this chat, Emily has an “a-ha moment” and realizes that she can help bring fairness into the classroom by intervening when students tease a child named Ling. White people inviting Black people to their birthday parties is not going to stop Black people from being shot by police officers. There is no logical correlation between these two things. Even more, the Black man shot and killed by a police officer very quickly leaves the White family’s conversation for far milder topics like parties and name calling. I don’t wish to dismiss micro-aggressions and bullying, but instead would have liked the authors to connect these forms of interpersonal racism to social institutions as well as state power, surveillance, and regulation. The text shifts focus away from the White family’s response to police shootings by introducing a Black family. Zivoin cleverly introduces the families as neighbors through a crisp image of a row house inhabited on one side by Emily’s family, and on the other side by the Black family the text zooms in on. A young brown-skinned boy with rosy-cheeks and fun blue glasses sits at his desk drawing a picture of a police officer. The man’s face is traced in brown crayon, although the child, Josh, does not color it in. Josh shows his picture to his mother and asks her if policemen can go to jail. She responds yes. He asks if the White policeman who shot the Black man will. She dodges the question, instead noting that what he did was wrong. However, his father interrupts, saying the officer will not go to jail. Like Emily, Josh has a race savvy older sibling, Malcolm, who explains that police stick together and do not like Black men. Malcolm notes he can get pulled over by a police officer just because he is Black. Josh, like Emily, has been taught fairness is a universal value, and is dismayed. For a second, it seems like the text might move in a more critical direction, but it does not. Instead, it reproduces the previously introduced narrative of fairness. Josh’s mother identifies strong Black leaders, Harriet Tubman, Martin Luther King Jr., and Nelson Mandela, who “helped others learn to be more fair.” No details of their collective activism are provided and struggle to transform social institutions and structures of power are ignored. There still seems to be some hope, for a second… Josh’s father hits the table, knocking over a chess piece. Josh asks why he is mad and his father exclaims that “‘we’re still treated poorly sometimes,’” which frankly seems like an understatement given that we were, momentarily, talking about the senseless shooting of Blacks in the US by police officers. The next page gives me heart palpitations. Yes, I had a very emotional reaction to this book. Josh seeks to clarify what he can do to stand against racism. He asks if he should tell people to “step off” like his big brother does when defending him from children making fun of his glasses. His parents respond: “‘Just like that.” Weren’t we reading a book about the police shooting of unarmed Black men!?! Along with being neighbors, Emma and Josh are in the same class at school. The next day, Omad, a new student with brown-skin and shy eyes stands in front of the American flag holding his backpack in front of him protectively. On the playground later that day, Emma and Josh invite Omad to join their soccer team. When another child tells them they have enough teammates, Josh tells him to “step-off.” The text ends with the three smiling children playing together: “And just like that, Emma and Josh gained a new friend, and started a better pattern in their school.” The message: you can make a difference and work to end racism by being nice to Black people, people wearing glasses, people named Ling, and new kids from faraway places. To be fair this text is published by the APA, and the authors are focused on changing prejudiced attitudes, but I am, frankly, disturbed that they used police brutality, particularly the murder of unarmed Black people by police officers, as a conversation starter, and then quickly changed the conversation. Any mention of Black Lives Matter and collective action was notably missing. This text reduces racism to personal bias, so personal actions become the solution. I really do not think this is the conversation we should have with children about racism.